Kombucha is produced by adding what is basically a “starter” to cooled, sweetened tea and letting the yeast in the starter eat the sugar in the tea so it can grow and ferment. The resulting taste – an acquired taste for me – is tangy, and is then flavored with fruit or fruit juice, bottled, and left to carbonate. It’s my drink of choice – full of probiotics and flavor, I notice that when I drink it regularly, my digestion is improved, I have more energy, and my food cravings are for whole, nourishing meals instead of the Oreo-and-Cheeto-variety cravings that might otherwise run rampant. The recorded health benefits of kombucha are numerous. According to Kristen Michaelis of Food Renegade, whose writings are always based on intensive study, logic, and evidence: kombucha is extremely helpful in detoxifying your body for a healthy liver and cancer prevention; glucosamines in the drink help your joints, and prevent and treat arthritis; and the factor I’ve appreciated most in my own life is that the probiotic content improves digestion by populating your intestines with good bacteria rather than the gross bacteria that come with a lifestyle of processed food and restaurant eating (I’m guilty of the latter). A healthy balance of gut flora in your system is a beautiful thing that even affects your mental state, reducing anxiety, depression, and lethargy. I can absolutely testify to the above. Four years ago, I was in the throes of a health crisis, and essentially non-functional from what turned out to be a very messed-up digestive tract. It’s amazing what stress can do to you. Our brains and our guts are intimately connected, and when one of them is compromised, the other one takes its cue and (immediately or eventually, depending upon the person) goes to hell. My version of hell included extreme lethargy, a fair amount of anxiety, and eight or more very productive visits to the restroom each day. Bathroom difficulties of the sort I experienced lead straight to inflammation, irritation, and malnutrition. It is a terribly difficult and discouraging cycle, because when your stress level messes up your gut, then your gut gets used to sending messed-up signals to your brain, and your brain sends messed-up signals right back to your gut, and it feels impossible to escape. My escape route was long and many components contributed to my eventual healing (a change in perspective on food, some very honest internal work, visits to a chiropractic neurologist, and help from a wonderfully kind naturopathic physician [here’s a related talk with my doctor – it gets good around the four-minute mark]). 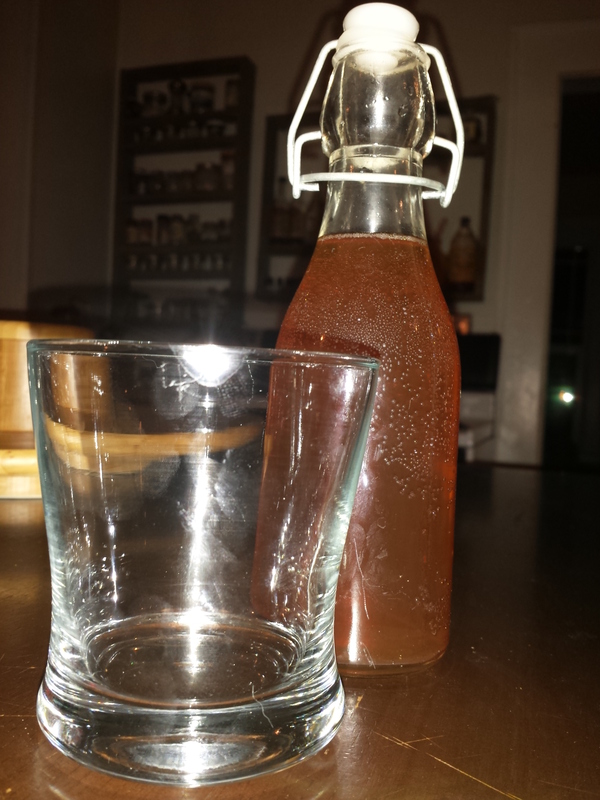 One thing that helped tangibly from the very beginning was the consumption of kombucha. Before I even knew what was wrong with me, my great friend Mary recommended I hit Whole Foods and stock up on kombucha. She was right – I immediately noticed a change in how I felt after beginning to drink it. The caveat here is that kombucha is EXPENSIVE. It’s not uncommon for a 16-oz. bottle to cost over $3! For the less wealthy among us, $90/month is a little much to spend on one person’s drinking habit – let alone the cost for my two-person household. So we spent a year or so swinging back and forth between “aaaaahhhh, we have no kombucha” and “aaaaahhhh, we have no money.” Then Joe, ever the financially sensible guy and lover of DIY effort, decided he wanted to take a crack at making the stuff. 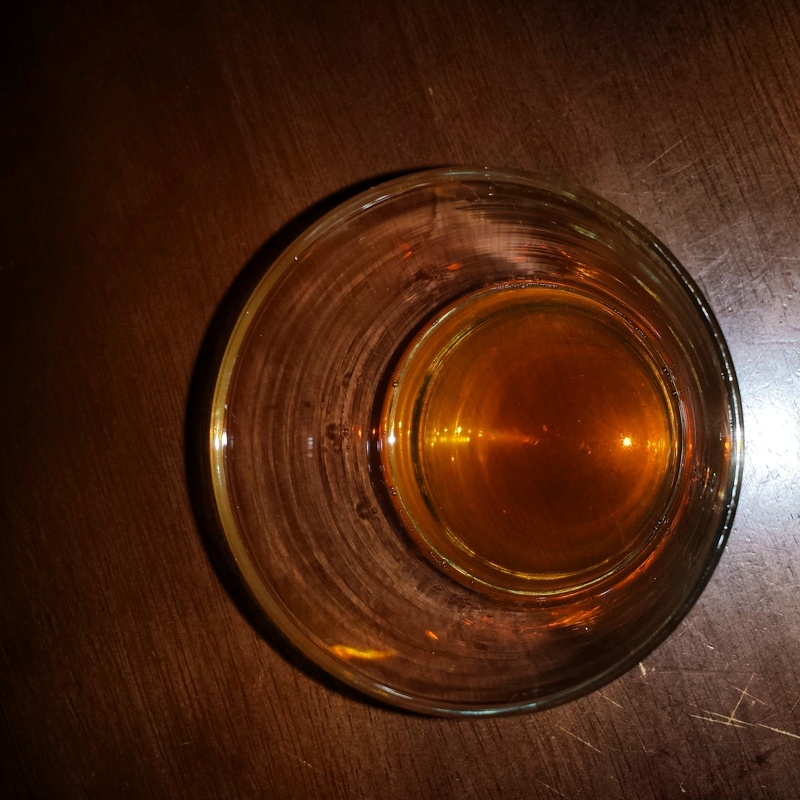 After a weird-tasting batch or two, he dialed it in and we’ve never looked back. Total cost per 16-oz. bottle – $ 0.36 to $ 0.40. That’s a nearly 800 percent savings per bottle. Plus, it’s easy. Plus, you choose the flavor. Sometimes we use mango juice. Sometimes we use cherry juice. Sometimes, when it’s strawberry season, we just pop a little berry into the bottom of the bottle for flavor, which brings the cost down more. If you love the booch, what’s not to love here? You can buy a starter here, or you can make your own starter with just a bottle of store-bought kombucha and a cup of sweet tea. From now on we’ll refer to the starter as the SCOBY, because it’s a cute name and because that’s what it actually is: a Symbiotic Colony of Bacterial Yeast. 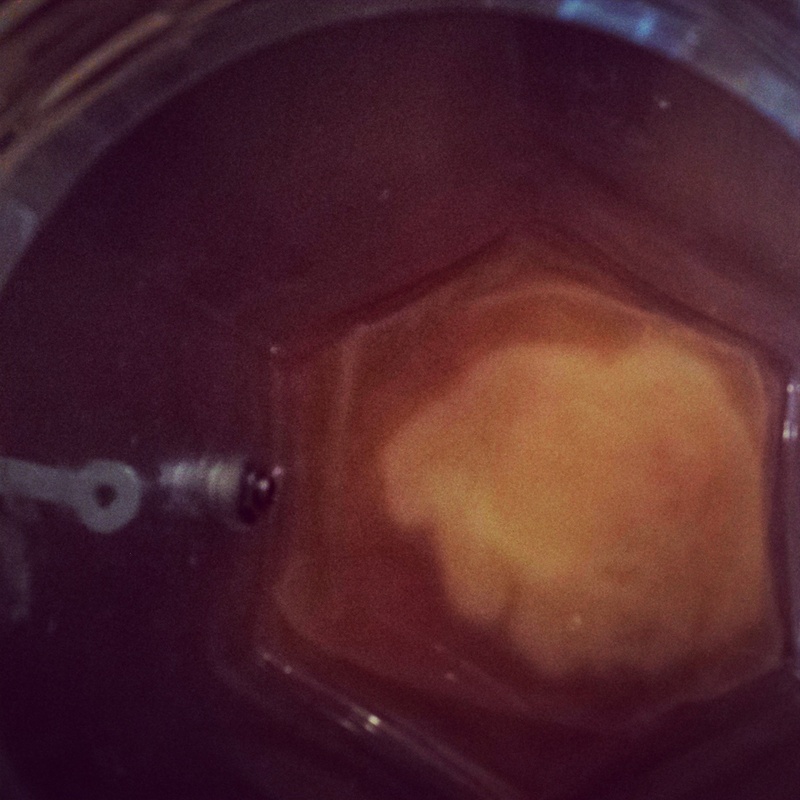 To make a scoby, dump one unflavored, raw bottle of kombucha into a very clean jar or drink dispenser. Brew a strong cup of organic black tea and sweeten it to death. Regular sugar is fine to use here, because the yeast eats it all up. Once the tea is cool, mix it into the kombucha, cover it with cheesecloth, a thin dish towel, or a paper towel, and rubber band that thing on. We want it to be able to collect airborne yeast for the fermentation process. The time it takes to ferment will vary based on the temperature of your home. 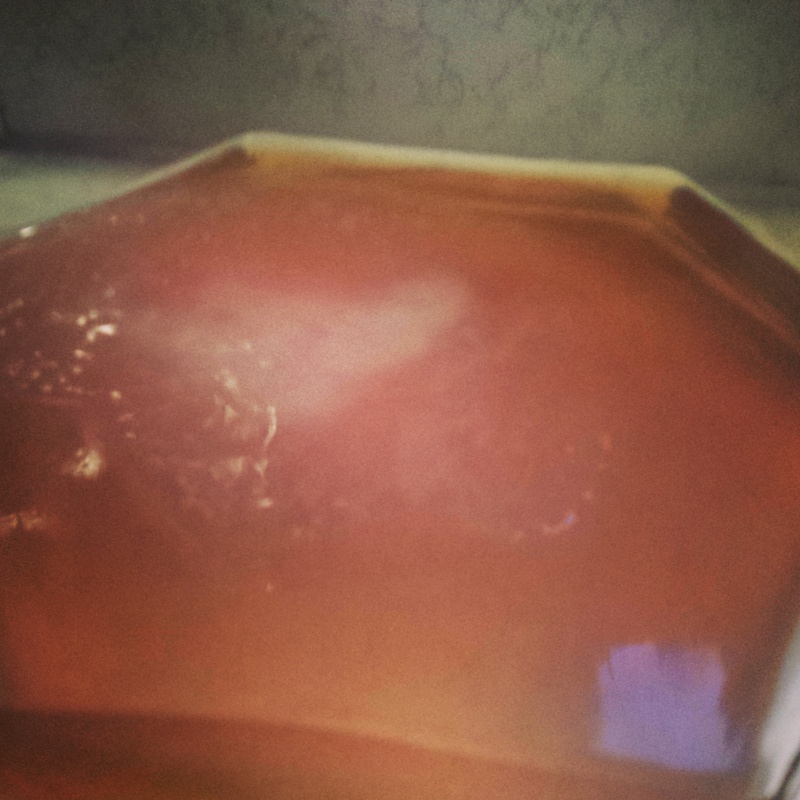 My SCOBY took about three weeks to grow in the dead of winter. I don’t keep my house as warm as others, and yeast loves temperatures around 75 degrees. All grown up and fermenting. To brew the actual kombucha tea, you will want to fill up a large stockpot – not your largest; the one that covers your whole large burner but isn’t super tall – with filtered water. Bring the water to a near boil, then take it off the heat, and let ten organic black tea bags bob about in it for five minutes. Take out the tea bags and stir in 2.5 C. plain white sugar. Let the tea cool completely, then gently pour it into a drink dispenser with the SCOBY. Cover again with a paper towel, thin dish towel, or cheesecloth and let it get to fermenting. This process will take (depending on the room temperature and the strength of your SCOBY) as little as four days and as much as two weeks. My little SCOBY was pretty thick and rubbery and tough, kind of like a placenta, and so it had more power, therefore the process was quick. Taste the kombucha after a few days. Is it sweet? Then it’s probably not ready to bottle. You don’t want it to be sweet, because that means the yeast is not finished eating all the sugar and so it won’t have the potency and health impact you’re looking for. Is it tangy, maybe even a bit vinegary? Then it’s probably ready to bottle. What are those gasket guys called? 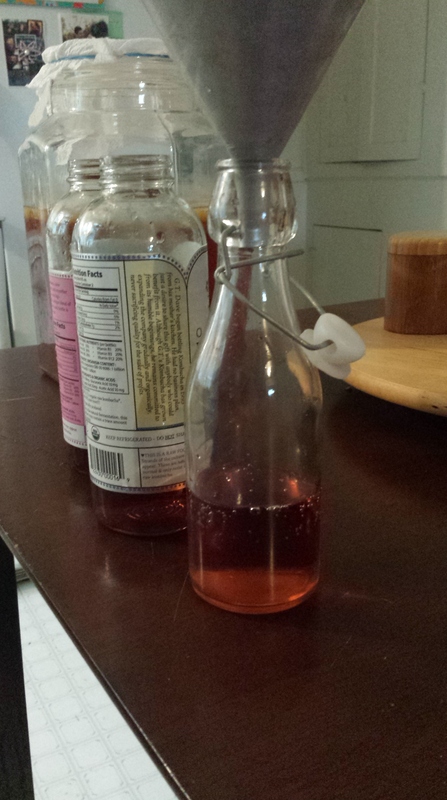 You can bottle in whatever you’d like, as long as it seals. I used, for your consideration, a mixture of old kombucha bottles, mason jars, and those cool little gasket guys. I don’t know what they’re called. Wash the bottles and lids in hot, hot water so they’re sterilized. Pour in juice to taste. I try to do a 90/10 ratio of kombucha to juice, but that’s just me. Pour in kombucha, leaving at least half an inch of head space, and then seal up those bad boys. 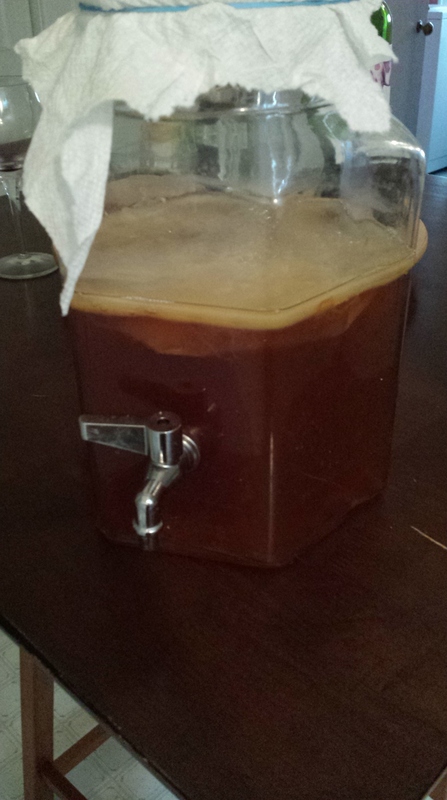 At this point, you can make another batch of sweetened tea and start the fermentation process over. That SCOBY will last a long, long time if you put it to regular use. Check the bottled kombucha after a couple of days. That second, sealed fermentation will trap in the bubbles and carbonate the drink. Once it’s carbonated to your liking, refrigerate the bottles and enjoy. I am really interested in your feedback here. Have you tried kombucha? Has it helped you? Have you made it yourself? Did you try this recipe? What have you found to be the common successes and pitfalls? 18 Jan	This entry was published on January 18, 2015 at 5:40 pm. 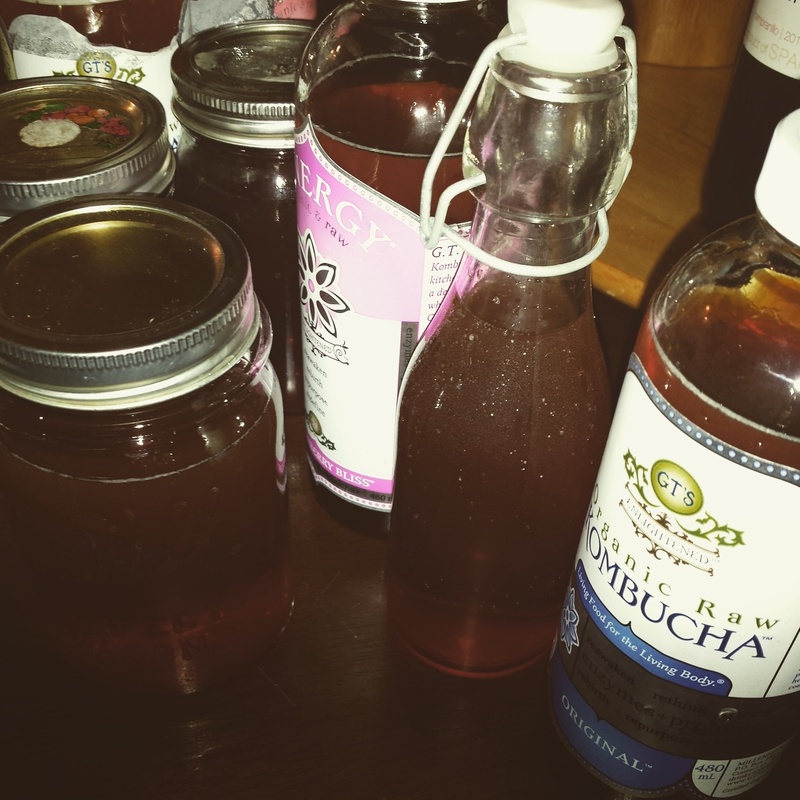 It’s filed under Collection and tagged DIY, from scratch, homemade kombucha, kombucha, kombucha health benefits, make your own kombucha, make your own kombucha starter, socby. Bookmark the permalink. Follow any comments here with the RSS feed for this post. Hey, I’m in the early stages. Got myself one of those ginormous 2 gal mason jars with a spigot and made two gallons of plain black sweetened tea. Hope it works out! I will let you know. I did get a SCOBY from a friend so didn’t have to start completely from scratch! I grow my own ‘buch at home and love it. After having to go to the ER with a bout of gastritis (possibly stress related, possibly just a bad bug), I figured I needed more ‘buch in my life and just ran with it. I now keep roughly 2 gallons going to first ferment at all times. My favorite is made with a green tea and hibiscus base (which turned the SCOBY pink) and the standard one I brew is oolong based, sometimes with some ginger thrown in on the front end. Wow, beautiful! What’s the ratio of green tea to hibiscus? I will have to try that my next go-round. Thank you for sharing.